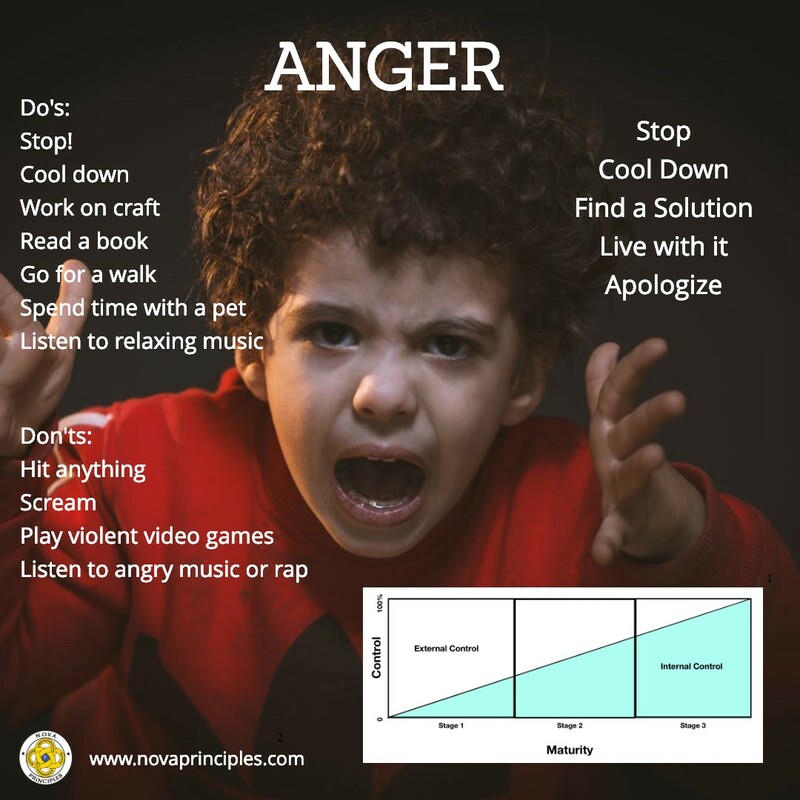 The focus of lesson seven is to teach students how to appropriately deal with and control anger. Students are taught the meaning of Control & Maturity. 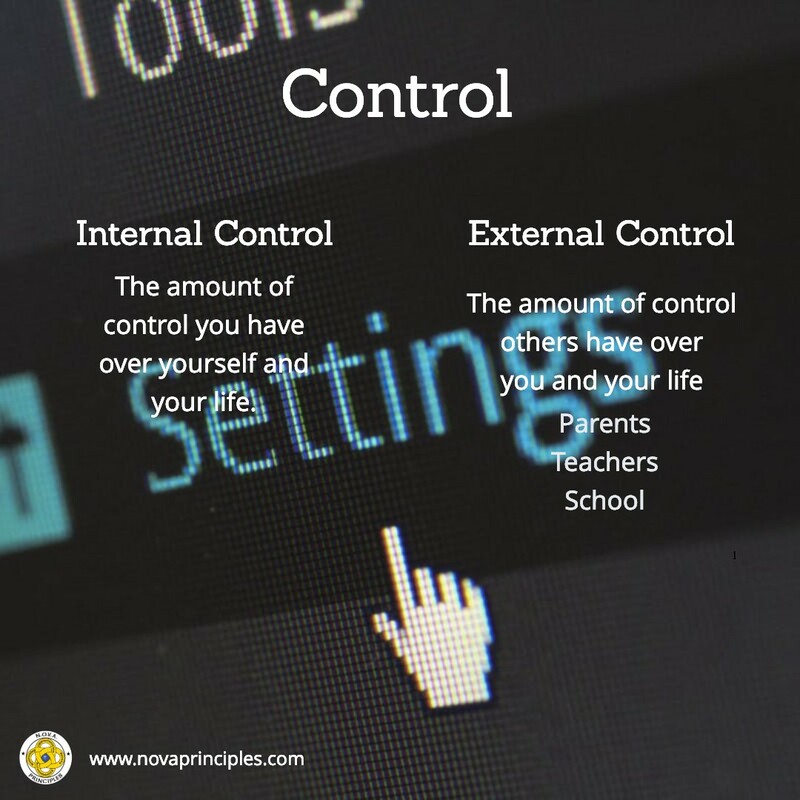 Control: The amount of control that you or others have over yourself and your life (which includes Parents, Teachers, School, etc.). Maturity: The degree to which you are able to control your actions and behavior. If you can control you actions and behavior well, then you are Mature. If you can’t, then you are Immature. Stage 1 Maturity: People who have Stage 1 Maturity are selfish, demanding, and controlling. They do little to cooperate or communicate. They like to argue, fight, and bully others. Stage 2 Maturity: People who have Stage 2 Maturity want to cooperate with others rather than argue and fight. They cooperate even if they don’t want to. They want peace, try to stay out of trouble, and try to work out their problems. They care about how their choices affect others. Stage 3 Maturity: People who have Stage 3 Maturity do the right things for the right reasons. Their decisions are based on good values, and principles. They do service for others, and forgive others who wrong them. They are responsible and disciplined. Students are taught that if they can understand the differences between each of these stages, then they are able to choose which stage they want to have, and if it’s their choice, then choose to have Stage 3 Maturity. Students are taught that having Stage 1 Maturity brings a person nothing but trouble and problems. On the other hand, people who have Stage 3 Maturity are on their path to excellence and success. Students are given some very basic information about how one’s brain works. 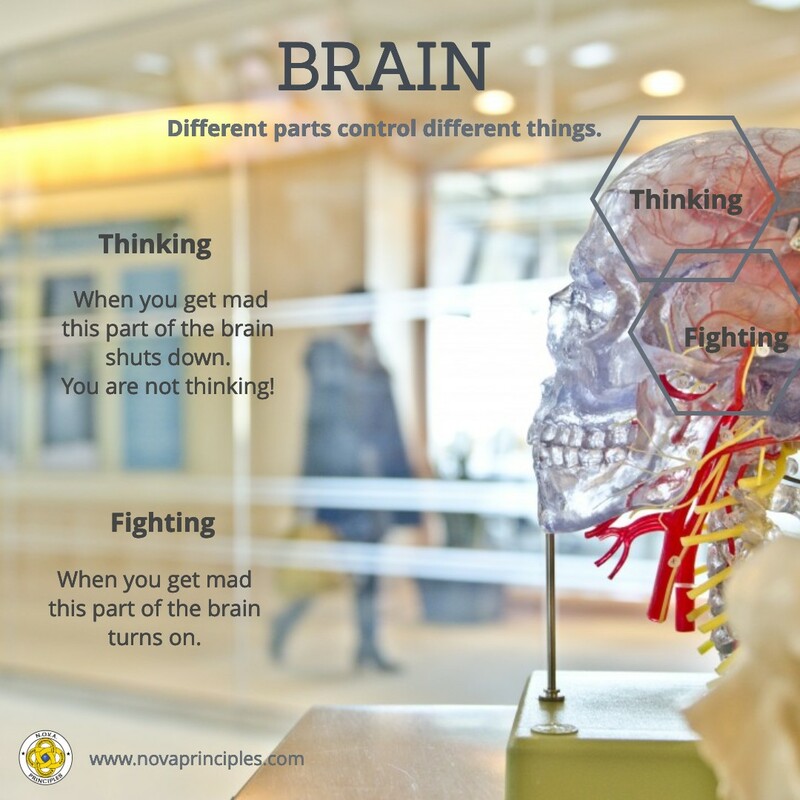 In a simplified manner, students are taught that there is a part of their brain that is responsible for thinking, and another part that is responsible for fighting. It is explained that when we keep the thinking part of our brain turned on, we can have Stage 3 Maturity, and avoid troubles and problems that come our way. It is also explained that when we allow the fighting part of our brain to be turned on, the thinking part turns off. When this happens, we are in Stage 1 Maturity and will likely get into trouble. Students are taught that no one can MAKE them angry or mad, that is something they choose to do. They are taught that if they can choose to get angry and mad, then they can also choose not to get angry and mad, however, this takes Maturity to do, it takes Stage 3 Maturity. The “Which Wolf Are You Feeding?” (Which wolf is stronger? The one you feed.) Principle is introduced. Students are encouraged to memorize this Principle as it becomes a new N.O.V.A. Challenge question. This Principle is derived from an old Indian legend where an Indian Grandfather tells his Grandson that inside of him lives 2 Wolves, one that’s filled with hate, anger, and violence, and the other that’s filled with goodness, kindness, and love. The Grandfather then tells his Grandson that whichever Wolf he feeds becomes the stronger inside of him. Students are encouraged to only feed their good, kind, and loving Wolf. 1. Stop: When you get angry, mad, or frustrated, stop. Stop so the thinking part of your brain can turn on. 2. Cool down: Here are some of the do’s and don’ts of cool down: Do: Take a time-out; Go for a walk; Shoot some hoops; Read a good book; Take a shower; Work on a craft or project; Spend time with a pet; Practice slow deep breathing; Listen to relaxing music; Talk to someone who cares about you. Don’t: Hit anything (including pillows); Scream or “let off steam”; Listen to angry music or rap; Play violent or aggressive video games. Things on the “Don’t” list have been shown through research and experience to promote and reinforce violence. They teach you to act out on your anger rather than work for a resolution. 3. Find a solution: Look for ways to fix the problem that made you angry. Chances are, if you’re cooled down, a solution will be easier to find because you are thinking. If you were in a disagreement or argument, find a way to work it out, even if you agree to disagree. Listen first then talk, in that order. That’s why we have 2 ears and 1 mouth. Listen twice as much as you talk. 4. Live with it: If a problem can’t be solved, learn to live with it. Accept the fact that there are things in life that we have no control over. 5. Apologize: If you’ve hurt someone’s feelings, be the first to say you’re sorry. As part of your registration for becoming a member of the “N.O.V.A. Parent Pack”, you have the opportunity to view the “N.O.V.A. Parent Seminar” video. This powerful seminar will give you the knowledge and tools to help you more fully understand the principles taught in this lesson, and help you get to your path of excellence! The foundation for this lesson was derived from the moral development model created by Dr. Paul Jenkins and Dr. Randy Hyde. You can receive additional parenting applications of this model by registering to receive Dr. Paul’s “Parental Power” messages and podcast. Follow us! Subscribe to our social media sites.